Out-of-favour Nigeria international John Owoeri highlighted his offensive qualities by scoring four goals for BK Hacken in their 4-3 win over Ljungskile in a test game held on Monday afternoon. The former Heartland star opened scoring in the fourth minute, then restored his team’s one-goal advantage in the 22nd minute after Tim Andre Nilsen had equalized for LSK. On the hour-mark, Owoeri bagged his hat-trick before finishing off his raid with his fourth of the afternoon five minutes later. 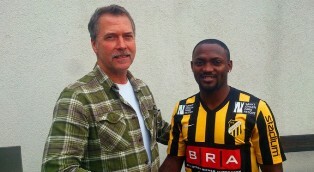 The 29-year-old ended his association with åtvidabergs FF at the end of the 2015 season by penning a deal that will keep him at BK Hacken until December 2017. The striker turned out for clubs in Holland, Belgium and Egypt prior to his move to Sweden in 2013.